Good food: would like to see a bit more creativity in the overall menu. Tia Rosa in appearance is a lovely little tapas restaurant, great from the outside and better from within. We were unfortunately left disappointed by our visit though. The food itself was good, well presented and very tasty. The speed in which it came out of a kitchen with three chefs was very disappointing however, considering the restaurant wasn’t even half full. I appreciate tapas doesn’t come out all together, but one dish every 10-15 minutes doesn’t really cut it. Does it really take an hour to prepare potatoes!? Which didn’t even materialise but did on our bill. Maybe we were there on an off night. Celebrated our 6 month anniversary there. W e enjoyed the food, I loved the wine. excellent food and service for a very good price!! We had booked for Easter Sunday and had to cancel so re-booked for Monday and we are so glad we did. 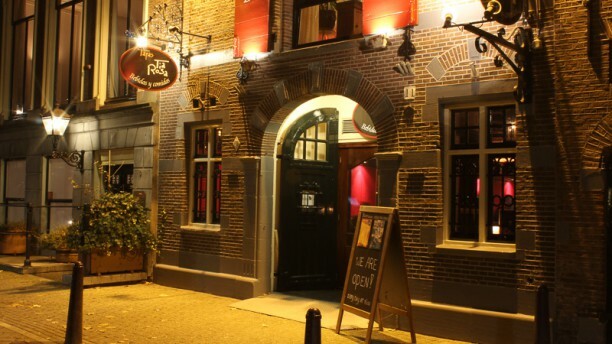 The restaurant is just off the Rembrandtplein square and is within easy walking distance from the centrum hotels. We were greeted by a friendly young man who asked us where we would like to sit so we sat at a table which is an extension of the bar. The restaurant was busy for 6.30 so we are glad we booked. The tapas are on a par with those we have had in Spain if not better. The kitchen is open plan at the end of the restaurant and you can see the food been freshly made. We chose five tapas and enjoyed them all. Recommendations for the veal, steak and calamari. A great wine list and fantastic service all round. Will certainly go again next time in Amsterdam. A must go place if you like tapas. No comments the whole experience was great. Great food, great service. Will come back. Place was busy and service a bit slow but super frendly and helpful - they really made our evening and our birthday party ! Tapas and dessert was really good. Leuk en gezellig restaurant. De sfeer voelt als een warme huiskamer. Het eten was super. Bediening was snel en goed. Echt een aanrader. Tapas correctes mais peu copieuses, tortilla sèche et fade, choix de vin limité. Food is very delicious and the staff is very attentive. However, the 7 course menu can be improved, the selection of dishes in October 2016 was nicer but I will definitely come back.